The NeoDCP Player is a software based DCP (Digital Cinema Package) player for the Windows operating system, suitable for studios and smaller cinemas. It is designed to allow viewing both DRM protected and unprotected DCP’s without the need of a dedicated cinema equipment (hardware based DCP player, projector etc). DCP is a standard created by DCI (Digital Cinema Initiative) for the distribution of Movies, Features, Trailers and Advertisements in a digital format. By using NeoDCP Player you don’t need expensive equipment to view a DCP. Use the control panel on the primary display and play videos on the secondary display or projector without tearing issues. Or use windowed mode for single monitor setups. 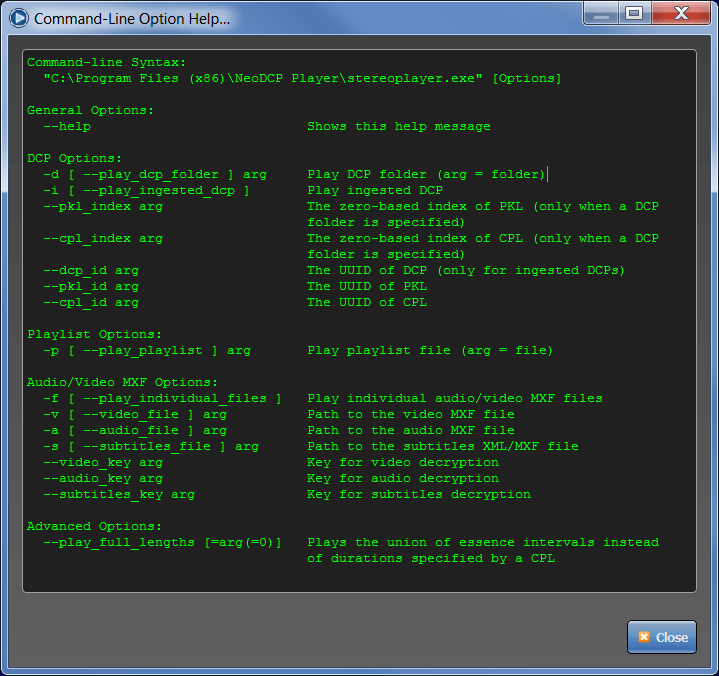 NeoDCP Player is capable to play also MXF files as simply as possible. Validation of selected files is done automatically. The Player is failsafe and it will not let you open files with invalid data structure. 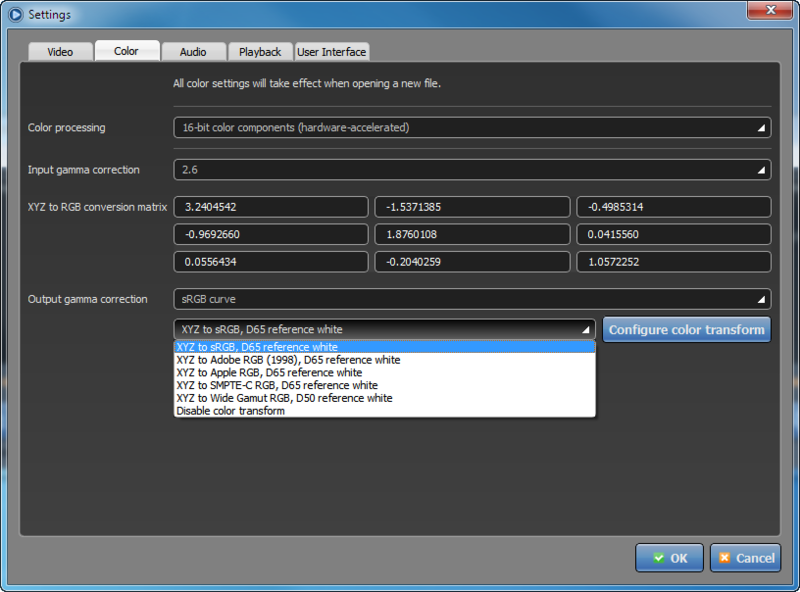 NeoDCP Player comes with powerful color space conversion settings. Colors can be adapted real-time depending on your needs. You can set 8-bit or 16-bit color processing, gamma corrections, etc. NeoDCP Player fully supports the playback of stereoscopic (3D) content (in DCP or MXF file format). The true stereoscopic output is enabled only in fulls-creen modes only. You can play the 3D content also in the windowed mode, but will only see one channel or both channels side-by-side. The 3D content should be transferred to the monitor or a projecting device via HDMI 1.4 or DisplayPort 1.2 compliant connection. Windows Display Settings – correct display devices must be assigned as primary and secondary. 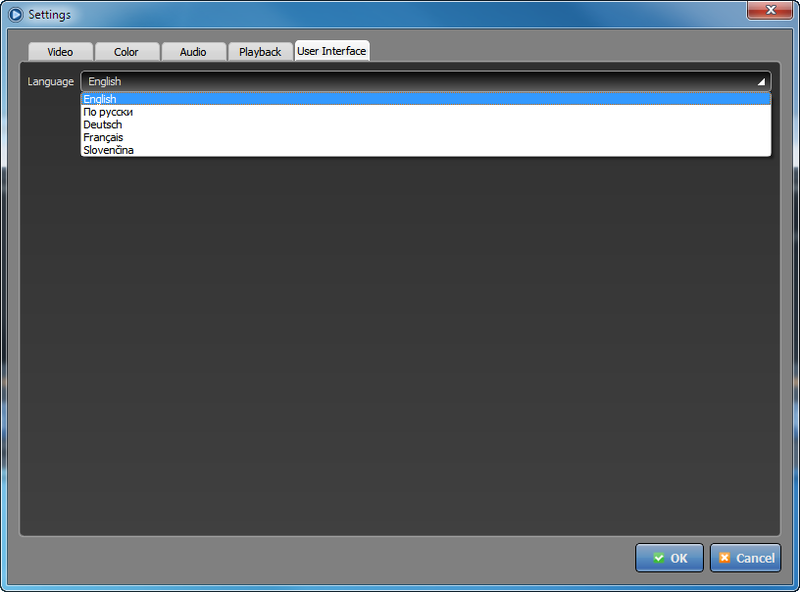 NeoDCP Player – correct fullscreen monitor and the full-screen mode must be selected. Once the NeoDCP Player and Windows display devices are correctly setup, 3D signal is automatically detected. For reliable 3D support we recommend to use a AMD/ATI graphic card, HDMI or other output depends on your needs (if you need to connect a projector or just monitor, etc). All other requirements are the same as for standard PC. You may want to use the nVidia graphic card, but it may require the nVidia 3DTV Play Software be installed on the system to enable stereoscopic output via HDMI. Therefore we recommend using AMD/ATI graphic card. Sometimes the DCP audio track is not perfectly synchronized with DCP video track. 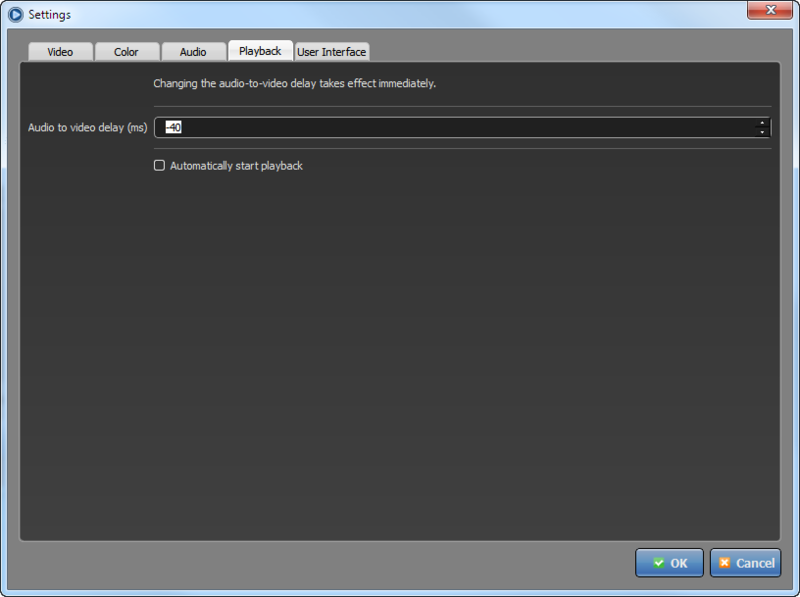 Therefore NeoDCP Player allows you to adjust the audio-to-video delay. If you go to the Menu -> Settings -> Playback settings, you can push the audio track against the video track in both directions using positive/negative value in milliseconds (ms). 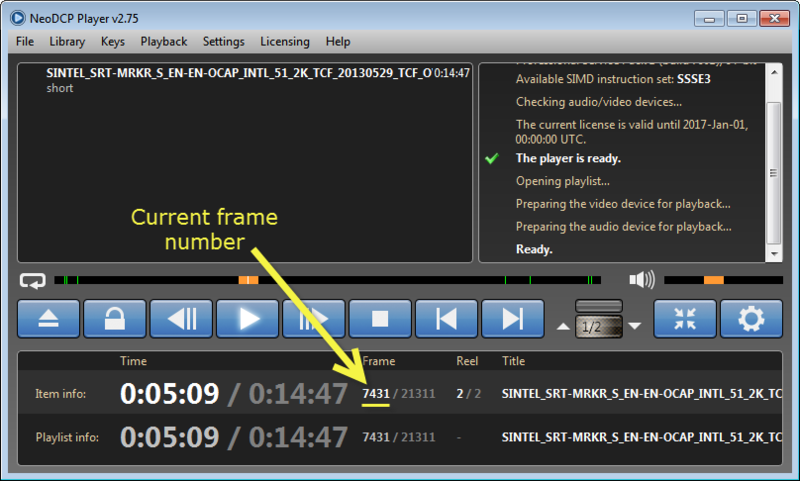 NeoDCP Player supports rendering of both types of subtitles – SMPTE and Interop. 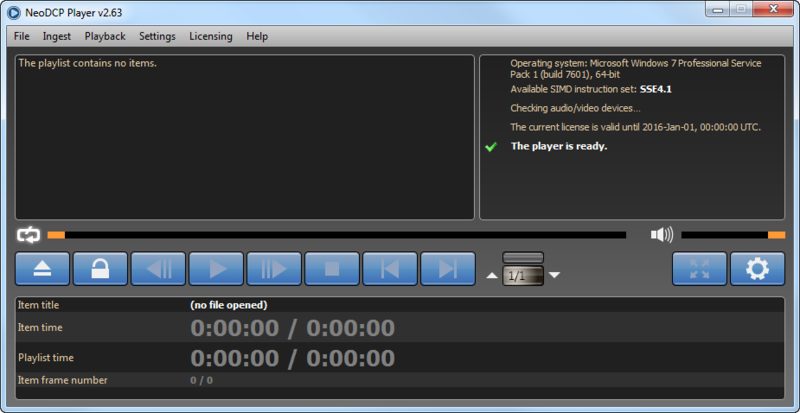 Additionally, encrypted subtitles are supported in Professional and Ultimate versions of NeoDCP Player. Premium video content is usually encrypted to protect it from unauthorized duplication. Of course, the video must be decrypted before it is displayed. The decrypted, uncompressed frames must then travel across a physical connector to the display device. Content providers may require the video frames to be protected at this point, as they travel across the physical connector. Various protection mechanisms exist for this purpose, including High-Bandwidth Digital Content Protection (HDCP) and DisplayPort Content Protection (DPCP) for digital outputs. Generally, these mechanisms involve encrypting or scrambling the signal before it goes to the display. The NeoDCP Player supports both HDCP and DPCP protection mechanisms. All you need is set output window to HDCP/PDCP-compliant device (display, projector, etc.) and start playing an encrypted DCP. The NeoDCP playback is automatically encrypted. NeoDCP Player will strictly refuse to output encrypted content via unencrypted channels – pure HD-SDI, VGA, etc. 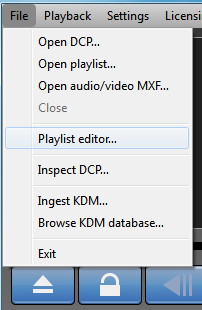 Playlist editor is located in application Menu -> File -> Playlist editor. Screen can significantly affect the way the film is seen and heard and the overall movie-going experience. Digital cinema projectors use electronic masking so that the image can be adjusted to exactly fit the screen dimensions. Correct adjustment of the electronic masking can dramatically improve the appearance of the image and improve the audience’s experience of the content. Adjustment of the projector masking must take into account all the aspect ratios that may be required as well as the physical properties of the screen, its fixed or variable masking and compatibility with film projection. You can setup the digital masking in NeoDCP menu -> Settings -> Video settings. DCPs can be “ingested” to DCP repositories – the ingest operation performs automatic integrity verification while copying DCP files to a DCP repository (any folder registered through Manage Repositories). The slightest anomaly cancels the import. A supplemental DCP is a DCP that adds one or several versions to an original DCP. 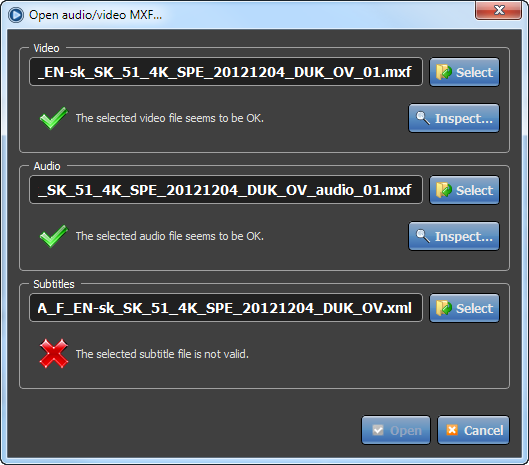 These versions may change the sound, subtitles or sometimes also the video. Supplemental DCPs do not contain the media they have in common with the original DCP, therefore the ingest of the original DCP must be done before that of the supplemental DCP. An automatic integrity verification that is very useful to make sure that DCP was not corrupted by for example copy process or during transport after the receival of HDD from content distributor. NeoDCP Player calculates hashes of the content inside the DCP and compares them with original hashes calculated by an author of the DCP. NeoDCP Player is able to utilize the wider color gamut of your display device without needing to resort to the much narrower sRGB color gamut. Also the colors may be rendered much more accurately, without more or less visible color casts that are typical for all uncalibrated displays. All you need is to owe or have access to a calibration colorimeter. Review your DCP/CPL to find the exact frame number before which you wish to place the intermission. For example, your CPL has 240 000 frames and you wish to put the intermission just before the frame 100 000. Create a playlist containing 3 items: CPL, pause and CPL. Yes, the same CPL is in the playlist twice. In advaced options for the first CPL occurrence choose the entry-point frame number 0 and the exit-point frame number 100 000. For the second CPL occurrence choose the entry-point 100 000 and the exit-point 240 000 (or, alternatively, 0). Save your playlist and open if from File menu -> Open playlist..
NeoDCP Player offers an option to move subtitles vertically and the possibility to manually override colors of subtitles. We weren’t sure about allowing such an intervention into the DCP projection, however our analysis has shown us that there are cinema operators who really need to display subtitles for example on the top of the screen just because they don’t have ascending seats or due to their cinema’s physical characteristics. 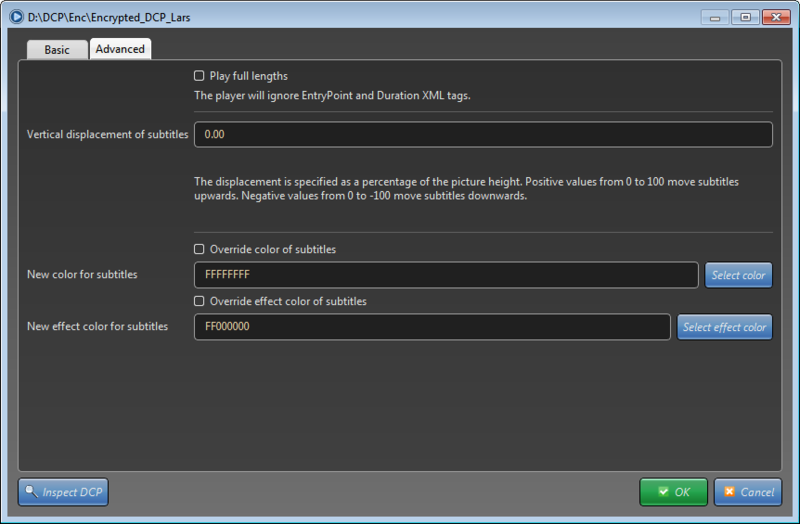 You may configure the vertical displacement of subtitles and override subtitle colors right after opening a DCP in the Advanced tab or per CPL in the Playlist editor in a similar way.